"Astronomy, including the use of a star calendar, played an important role in ancient Mesopotamia, and deeply influenced its religion: all the main gods were symbolized by particular stars or planets. In West Asia, one or two "star" symbols placed near the head distinguished divinities in pictorial representations. The practice seems to have been borrowed by the Indus civilization, for a seal from Mohenjo-daro depicts an Indus deity with a star on either side of his head enclosed by a pair of curved horns. (Asko Parpola, The Roots of Hinduism, p. 272). 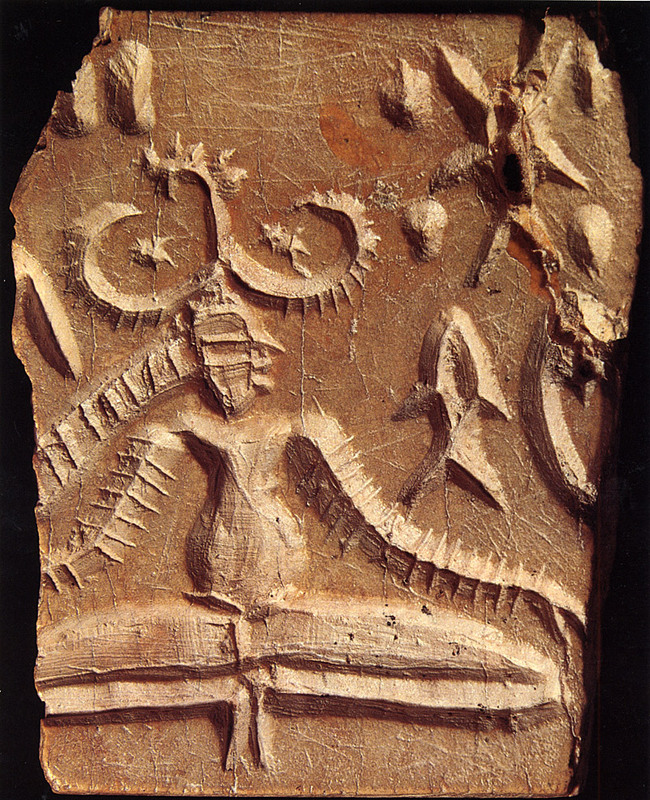 Elsewhere he writes: "Indus signs (including 'fish' signs) and a deity sitting in a yogic posture on a fragmentary seal from Mohenjo-daro (M-305). There is a star in both loops of the buffalo horns worn by the deity in the head-dress, which also bears a fig branch. (Asko Parpola, Deciphering the Indus Script, p. 185).